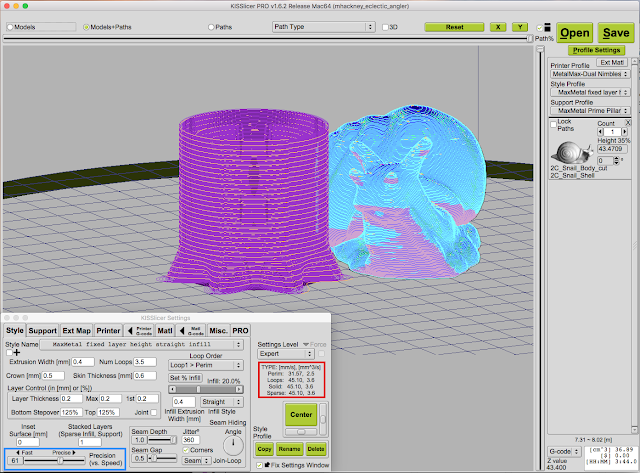 This clutters up their slicer settings with lots entries – simply so they can see what their current print speeds are. Not only are the speeds clearly displayed on every settings panel (highlighted in the red box in the screen capture), KISS even shows the max flow rate – arguably a much more useful bit of information. When you want to tweak your print speeds – maybe to improve print quality a bit or simply speed things up to print a part quickly – simply slide the Speed Slider shown in the blue box. Of course, the speed and flow settings automatically update so you get immediate feedback. Some users moving to KISS from other slicers get lost when it comes to setting speeds because they've been coerced into a particular way that slicer does it. So, to make that transition easier and to further describe the power of KISSlicer's speed management, I created this tutorial video: All About Speeds. No Comment to " Why I love KISSlicer: Reason #7 "